Being deaf is something that is a challenge for any individual on a daily basis, but with Matt Hamill he took that disability and turned it into something amazing. Recently retired MMA and UFC fighter Matt “The Hammer” Hamill had a great career but that’s not what led him to the top. Hamill looked at being deaf as not being a challenge but being a small obstacle in his life. 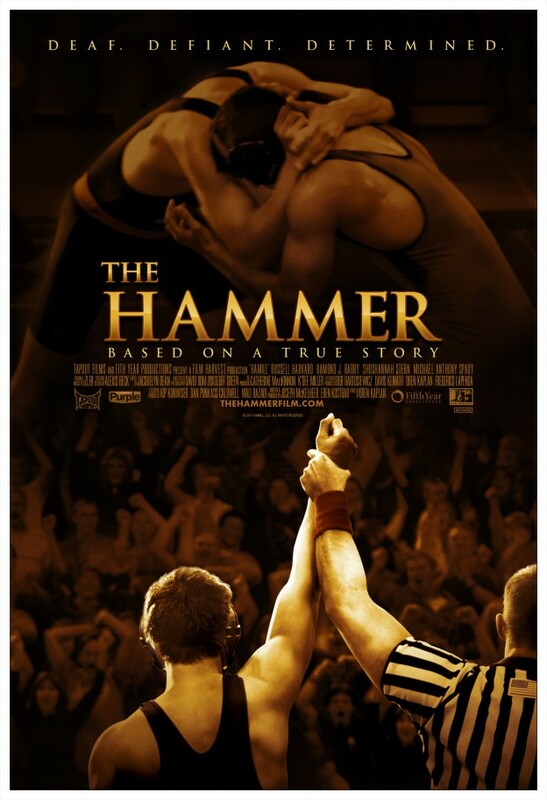 With Producer Eben Kostbar overseeing the development of the Hammer film along with TapOut Films, it was a certainty that this movie would tell Matt Hamill’s incredible story. From the beginning of his life of being a deaf child in a group of people who wouldn’t give him a fair shake to fit in, to becoming a college wrestler and fulfilling his dream of becoming a champion. With this film it depicts his life in a way that not only that people will see the struggles he faced years through his life and what it took to overtake those forks in the road. He was uncertain on what he wanted to do in life even working at his grandfather’s auto repair shop after dropping out of college. It was a struggle at times for to doubt himself and not knowing what his path would be filled with.With Russell Havard who played Matt (also a deaf actor) he could relate to the problems and compare what he had to go through. Russell really used his mannerisms well in this movie to really put in the effort to learn the wrestling moves, and mirror Matt in every way possible. Watching this movie was not only a true testament to the fighter's career, but to everybody involved that worked on the film. They tried to revisit the entire world that was Hamill’s at one time and having some familiar actors fill those roles makes this movie that more watchable. Going from a little child to a full grown adult and not sure of what your days hold is something that Hamill dealt with and still does with great will power and dignity.. Being retired doesn’t make him less of a person because he feels that passion isn’t there anymore but with this movie already getting great reviews from others there’s no reason why he couldn’t come back when the time is right. When I finished watching the movie I was impressed with every aspect of what makes a great film. The script was really focused on the adversity and how he pulled things together when you think he has lost everything. Being deaf for Matt Hamill isn’t something he focuses on because he doesn’t like the attention, however this film showed that a lot of people take things for granite every day and how Matt Hamill overcome many obstacles that many wouldn’t see in a lifetime.